When I am out of town, my mother is caring for the dog, the cat, and Kiwi the Grey. Asking her to care for my foster parrot is a lot. The rescue needs to keep track of the progress of each bird, and my regular travel schedule is a good opportunity to evaluate. I don’t want the bird to get too attached to my house, or for my house to get too attached to a bird. When a foster family starts dodging requests to bring the bird back, it makes everyone jumpy. I want to set an example for how it should work. In my two longer-term foster assignments, there were good reasons. With Manu, the Amazon, the rescue facility was under construction for a really long time. The more birds in foster care, the fewer cages we were tripping on at the facility. I fostered him to adoption and it was fabulous. I brought Sigmund home this weekend when I returned from DC. He had done fine most of the time I was gone, but started picking his feathers again a couple of days before. He seems happy enough and comfortable at my house and we want to see if we can get him to leave the feathers alone. 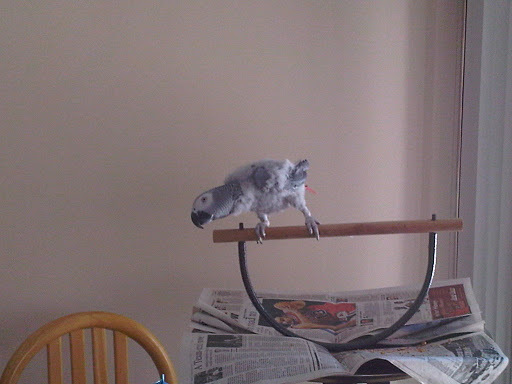 He is a great bird – incredibly adoptable – he just looks funny. He has long been a feather-picker, so that might not change. But he doesn’t ask for much: just some good food and good company. I am sure we can find a great home for him. Here’s hoping. This entry was posted in pets, Refuge.